Sylvie Brunet-Grupposo has been named by the French press one of the greatest singers of our times who excels in the French repertoire as well as in the dramatic mezzo roles from Verdi to Wagner. Since her debut the French mezzo-soprano with Sicilian roots has been invited to many international opera houses. She interpreted the title role of Gluck’s Iphigénie en Tauride under the baton of Riccardo Muti at La Scala in Milan, the title role in Bizets Carmen in Toronto (conducted by Marc Minkowski) as well as on many other European stages, Roussels Padmavati at the Théâtre du Chatelet, Dalila in Samson et Dalila in Catania, Sevilla, Bonn and Bucharest, Mme De Croissy in Les Dialogues des Carmélites at the Opéra National de Paris, in Santiago de Chile, Seoul and at the Bavarian State Opera in Munich (directed by Dmitry Cherniakov, DVD published by Bel Air), Sélika in Meyerbeer’s L’Africaine at the Opéra du Rhin in Strasbourg, Octavia in L’incoronazione di Poppea at the Festival d’Aix-en-Provence and in Vienna (DVD published by Bel Air), Taven in Gounod’s Mireille at the Palais Garnier in Paris (DVE published by Bel Air), Jocasta in Stravinsky’s Oedipus Rex at the Théâtre du Capitole in Toulouse and Santuzza in Cavalleria Rusticana in Sevilla and in Dublin. Recently Sylvie Brunet-Grupposo had triumphal successes at the Théâtre de la Monnaie in Brussels as Azucena in a new production of Verdi’s Il Trovatore (conducted by Marc Minkowski, directed by Dmitry Cherniakov) and also with her debut as Géneviève in Debussy’s Pelléas et Mélisande. As a concert singer she has been heard in numerous recitals in Paris, Moscow, Prague, Belgrade, Budapest, Milan, Rome, Florence, in Japan and Canada. She has been invited to sing with many of the great orchestras, such as the Symphonic Orchestra Bayerischer Rundfunk, Deutsches Symphonie Orchester Berlin, Symphonic Orchestra of SWR Baden-Baden, CBSO Birmingham, Mahler Chamber Orchestra, RAI and Radio-France. Her concert repertoire includes Nuits d’été and Marie in L’enfance du Christ by Berlioz, Poème de l’amour et de la mer by Chausson, Shéhérazade by Ravel, the Verdi Requiem, Beethoven’s 9th Symphony and worked with conductors such as Riccardo Muti, Gary Bertini, Kurt Masur, Marc Minkowski, Kent Nagano, Georges Pretre, Ludovic Morlot etc. She was awarded the “Premier Grand Prix à l’unanimité” by the Friends of the Opéra national de Paris (“L’association pour le rayonnement de l’opéra de Paris”), for her interpretations of the great French mezzo roles. She received the “Prix Claude Rostand” for her interpretation of Madame de Croissy in Robert Carsen’s production of Les Dialogues des Carmélites as well as the Premier Grand Prix of the “Fondation de la Vocation”. Sylvie Brunet-Grupposo made her debut at the Festival Chorégies d’Orange as Ulrica in Verdi’s Un Ballo in Maschera in the summer of 2013, followed by her debut at the opera house in her hometown Lyon (Les Dialogues des Carmélites). She could be heard as Geneviève in Pelléas et Mélisande in Paris and in a world premiere of Philippe Hurel’s Les Pigeons d’Argile at the Théâtre du Capitole Toulouse. Recent engagements include Mireille (Taven) in Avignon, Mme. de Croissy in Les Dialogues des Carmélites at the Teatro Petruzzelli in Bari, the Nurse in Dukas’ Ariane et Barbe-Bleu at the Opéra du Rhin in Strasbourg, as well as Geneviève in Debussy’s Pelléas et Mélisande in Lyon. 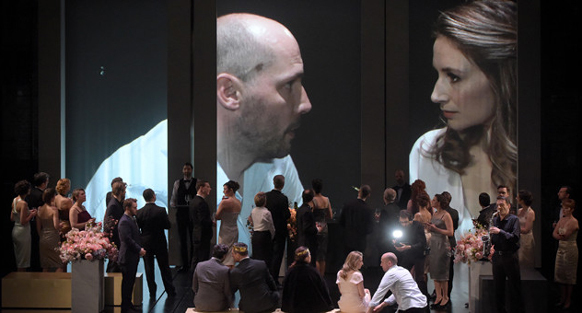 Future projects among others are Les Dialogues des Carmélites at the Bavarian State Opera in Munich and La Vestale in Brussels. When she found out her father’s identity in 2005, Sylvie Brunet-Grupposo decided to add his name to her own. Compte rendu, opéra. Paris. OPERA-COMIQUE, le 18 décembre 2018. Ambroise Thomas : Hamlet. Stéphane Degout, Sabino Devieilhe... Orchestre des Champs-Elysées. Louis Langre, direction. Cyril Teste, mise en scène.